We believe that cats are the epitome of cool. And it seems like many of you agree with us! Thanks to you more than 100 cool cats are celebrating the first days of 2016 with their new families. However, there are still a number of funky felines looking for their new home this summer. There is still time for you to learn the ways of the cat this summer! 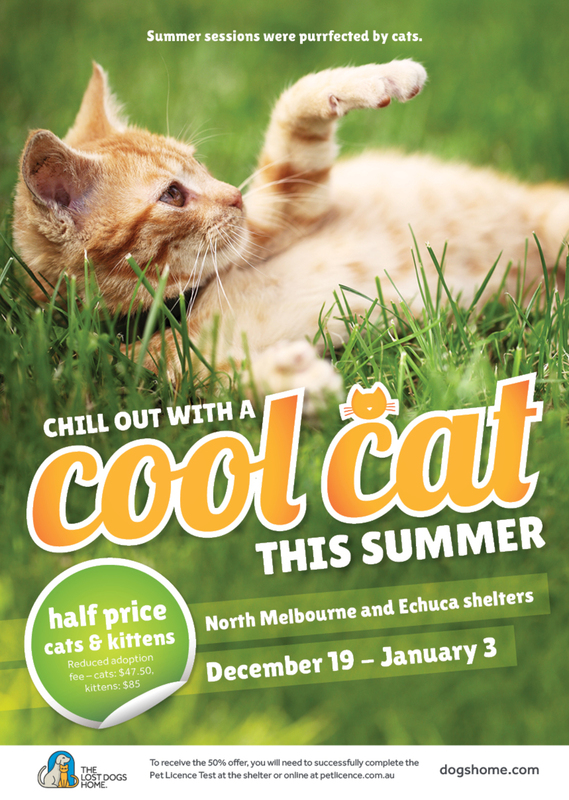 Visit our North Melbourne and Echuca shelters before January 3, 2016, that’s this Sunday, and receive 50 per cent off the adoption fee of cats and kittens. You can view all the cats and kittens available for adoption here. Some of our recent Paw-Mates including Neko, Billie Barnacle and Muffin are still looking for their forever homes. You can read a bit more about them here. Could you be the perfect match they are looking for? Adopt your chill-out companion today! Adopt before January 3 and for a cool $47.50 for cats and $85 for kittens under six months, you could have a new addition to your family these holidays. Each cat comes fully health checked, desexed, microchipped, vaccinated and wormed – all costing in excess of $300 per cat! Adopt: View our terrific range of cats and kittens at dogshome.com. Then visit our North Melbourne or Campaspe shelters to meet them in the fur – our staff are keen to find you your perfect match! Don’t forget to complete your Pet Licence Test to take advantage of this limited offer! Foster: We are always on the lookout for foster carers to help care for cats and kittens at the Home. With foster care periods averaging from two to four weeks, this is a terrific way to give a cat time out in a home environment, while creating essential space at our shelters. All expenses are covered and successful applicants will be notified within two weeks of applying. Advocate: If you cannot adopt, why not advocate for a cool cat looking for a new home these holidays? Share adoption candidate profiles via your Facebook page, email or via good ol’ word of mouth!